The newly married Colin and Melva Winch took up their first mission assignment in the Solomon Islands as nurses in 1956. 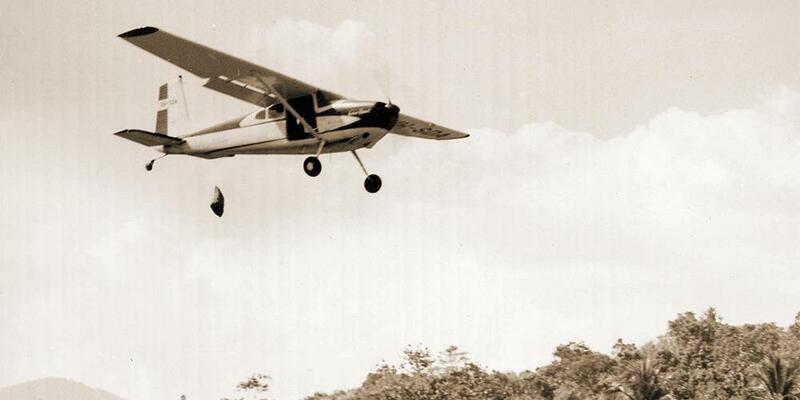 While on furlough in Australia in 1962, Colin obtained his commercial pilot’s license and, working with fellow pioneer pilot Len Barnard, flew the first Seventh-day Adventist mission planes, reaching the remote areas of Papua New Guinea and the islands of the South Pacific. The following account is one of Colin’s first challenges at an outpatient clinic. It was an early morning session at the outpatient clinic at Amyes Memorial Hospital. Colin and Melva had recently arrived in Kukudu, and this was one of Colin’s first clinic sessions. The first ten patients presented with only minor maladies, but this changed when Jacob—a large, well-built Solomon Islander with a mop of curly hair—presented, holding his jaw. Assuming he had a tooth problem, Colin seated the patient on the folding dental chair that had been donated by the United States Army. Inspection revealed an excellent mouthful of shiny white teeth, but the crown of a huge molar had broken off, creating the discomfort. Colin discovered Jacob had already sought dental treatment from another “doctor,” who had failed in his attempt to remove the offending molar and snapped off the crown in the process. Having prepared a mandibular block, Colin approached Jacob with the gleaming needle at the ready. Jacob knew all about that needle and withdrew his head as Colin endeavored to inject the anesthetic. To make sure of deadening the area, Colin injected the anesthetic into the gum beside the tooth as well. While waiting for the anesthetic to take effect, Colin noticed the audience below the clinic windows, listening to the commentary provided by the observers at the door. The outpatients were curious to know whether the new “doctor” could be trusted as a dentist. Selecting the lower-jaw forceps, Colin approached the apprehensive patient. With Lakana continuing to hold Jacob by the hair, Colin planted his feet firmly on the floor, gripped the molar, squeezed and pulled, pushed, levered, and pulled again. The tooth did not move! Failure as a “dentist” had become a real possibility. Eating coconut and native foods had made for strong teeth. The day was hot and steamy. Any ventilation that might have reached Colin had been blocked by the curious and excited spectators. Those with a clear view of the procedure continued the commentary to those who could not see. There were beads of perspiration on Colin’s brow—also on Jacob’s, although for different reasons. Colin selected alternative American-donated forceps and gripped the offending tooth once more. Jacob sank deeper into the chair, still restrained by Lakana. Pull! Push! Pull! It seemed like an hour to Colin as he worked on that tooth without success. Some of the observers were beginning to have doubts! Others were beginning to leave, deciding the new “dentist” was no good. “No, I don’t think so, Jacob,” he replied. Colin checked the sterile tray. All was in order. Expectations rose again. Some of those who were about to leave decided to stay to observe the answer to prayer. Back in the chair, Jacob received another pain-deadening injection. Taking up the same pair of forceps, Colin offered another silent prayer, and placing his feet firmly on the floor once more, gripped the molar and pulled. Those four huge curled molar roots came out as easily as pulling a nail out of soft timber. “It’s out!” went up the cry as Colin held up the offending tooth. In his excitement, Lakana had failed to loosen his grip on Jacob’s hair. But, with an enormous grin and blood dribbling from his mouth, Jacob praised God for the miracle. So did Colin. His reputation was intact, and his dental practice began to flourish. Ross Goldstone and Colin Winch are close friends and golfing mates, both now retired in Cooranbong, Australia. After listening to Colin’s flying stories over the years, Ross has put them into print for all to enjoy.